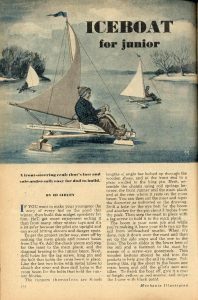 These Mechanix Illustrated plans for a front-seater junior ice yacht never caught on but you can still “make your youngster the envy of every kid on the pond” with a modern Ice Optimist iceboat. The illustration reminds me of the 2008 video of the Stern-Steerer Kid, embedded below the plans. 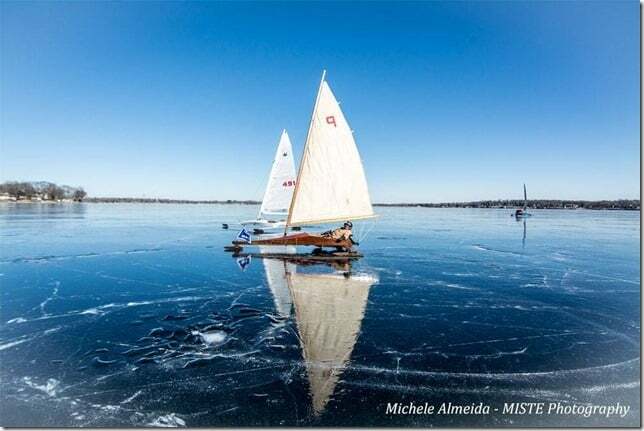 (Not Mike Plant but needed a Minnetonka photo with famous iceboaters.) 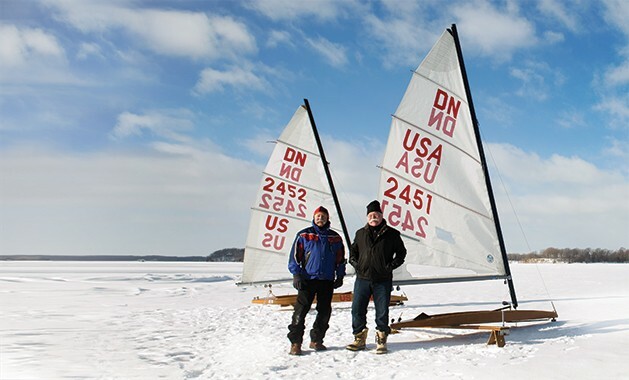 Lake Minnetonka iceboat sailors & Olympians Bill & Harry Allen in 2014. 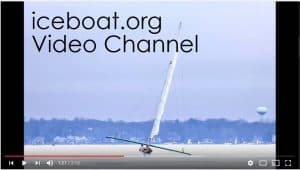 Hoofers Sailing Club is bringing the feature documentary, Coyote: The Mike Plant Story to the Wisconsin Union Theater on August 18th. 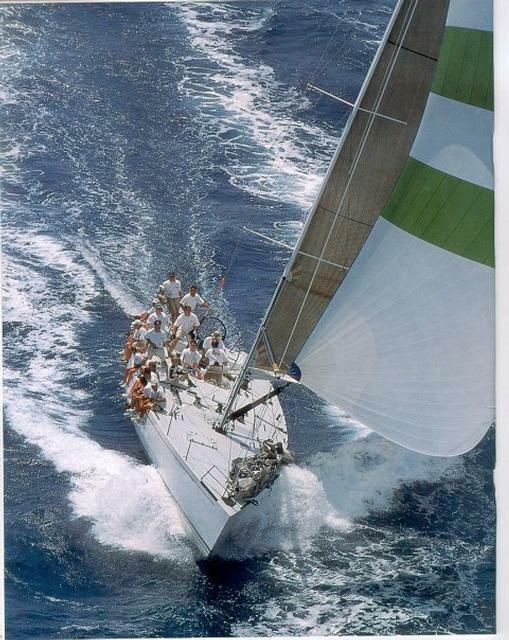 Mike Plant was born in Minneapolis and began his sailing career on Lake Minnetonka. 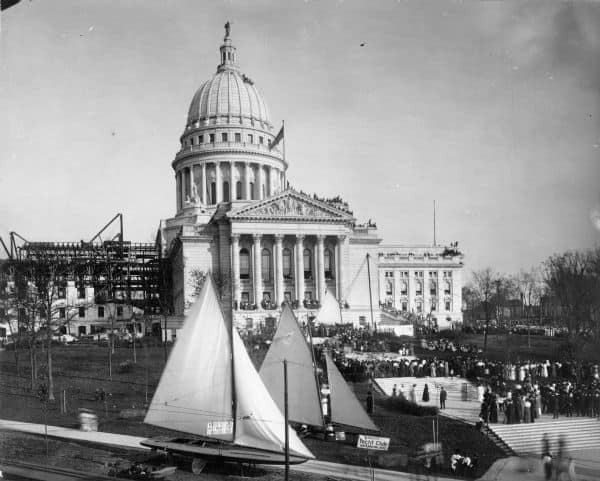 An audience favorite at countless film festivals, Hoofer Sailing Club is proud to bring Plant’s story to Madison and celebrate an iconic Midwestern sailor. All proceeds of this event benefit the Hoofer Marina Project. 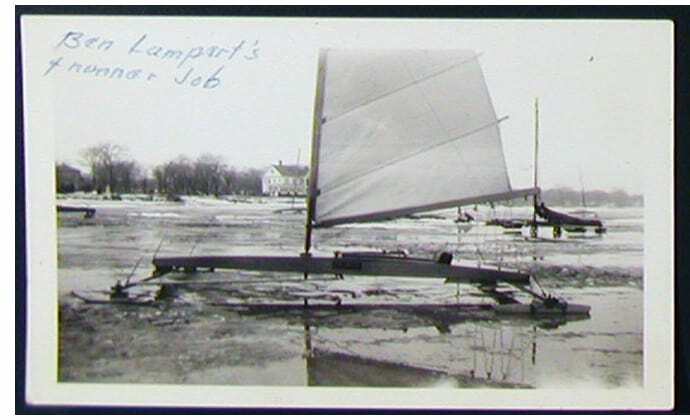 The 4LIYC and Mendota Yacht Club have been actively promoting wooden boats in Madison since the late 1800s. Another summer milestone is here, meaning we are nearer to December’s hope for ice. Stop over to the Edgewater Hotel tomorrow (Friday, August 3) around the noon hour for a look at some of these wooden beauties. Our Commodore Don Anderson will be there with a couple of his classics. Instead of a static boat show on Saturday, the group will cruise around Lakes Waubesa and Monona. 4LIYC Renegader Andy McCormick is one of the program directors for the Glacier Lakes Chapter. More information at the link above. The photo above from 1914 is posted on the Wisconsin State Historical Society website. 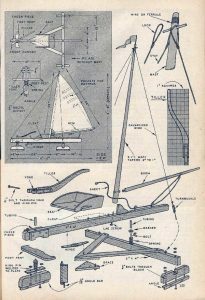 Here’s some content for the doldrums of ice sailing, technology that never caught on. 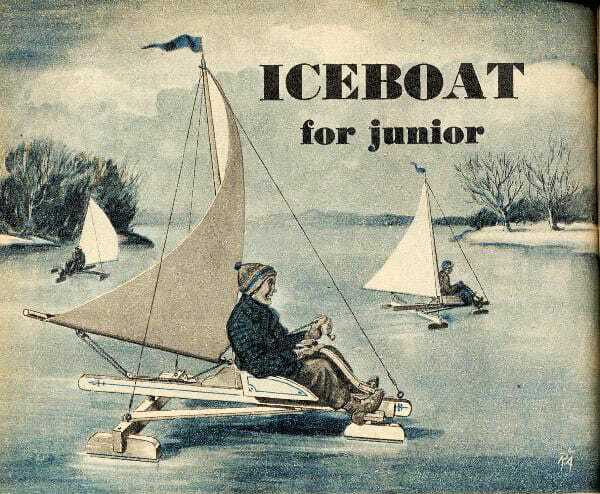 As I’ve stated before, iceboating appeals to dreamers. Some of their ideas became standard equipment but most didn’t. 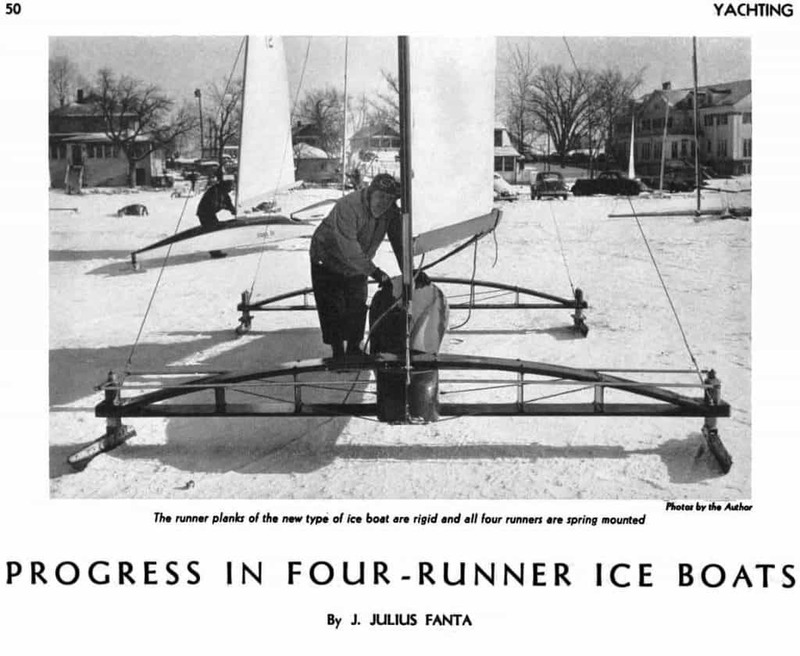 In the 1930s and 40s, yachting author J. Julius Fanta must have taken a fancy to the idea of a four-runner iceboat and wrote at least two articles about them. 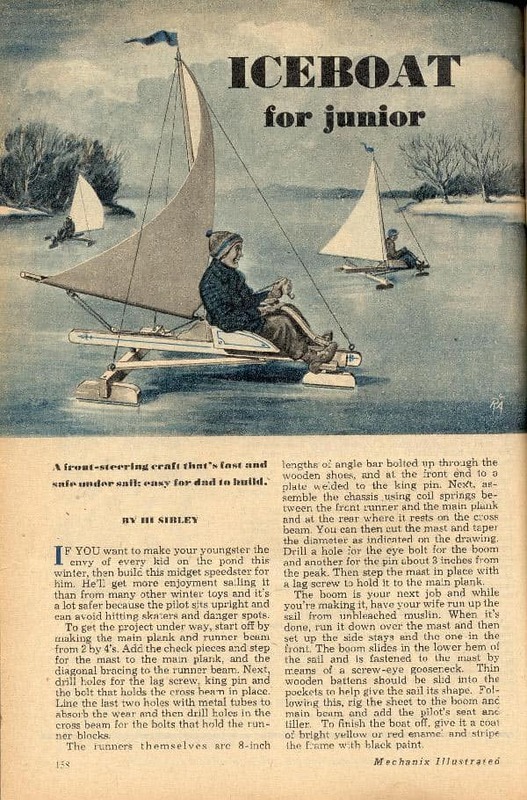 In a thoroughly detailed article in Yachting Magazine about a four-runner Skeeter developed on Geneva Lake, he predicted “the four-runner iceboat is the coming thing in ice yachting and not a fly-by-night experiment.” Four-runner iceboats never became popular because they were not an improvement upon a standard three-runner iceboat. Download the Yachting Magazine article in pdf. In a 1940 Popular Science article, he presented detailed plans for a four-runner stern steerer. A four-runner Skeeter was photographed by Carl Bernard at the 1947 Northwest on Lake Winnebago. Skeeter Ice Boat Club member Bob Ferris built and raced a 4-runner Skeeter. I believe this was in the 1950’s. This boat had a springboard at the bow and also at the stern with a runner on the end of each springboard. My recollection is that the runners at each end were steering runners and could be turned via cables and foot pedals. The runner plank was located approximately half way between the two ends of the boat. of the runner plank “floated” slightly above the ice surface. competition sailing on the “straight away”. Only the Bob Ferris design would turn on a dime. Only three of his runners were touching the ice, what ever runner that was on the windward end of the runner plank was floating above the ice. The 4 runner boats that essentially were a rectangle would not be able to turn on a dime. 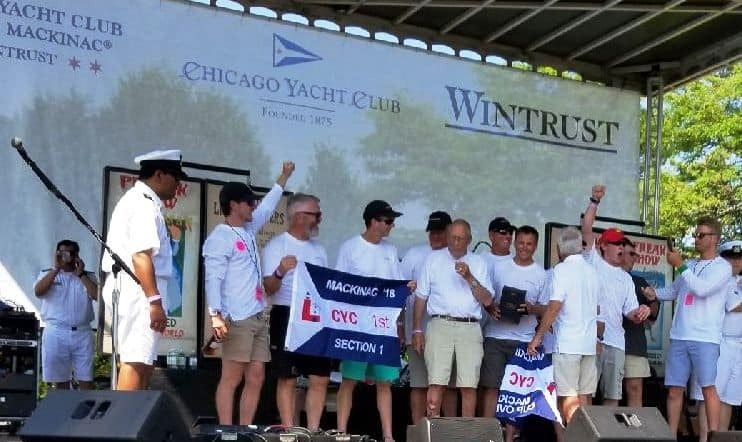 Another sign of the high season of summer approaches, the Race to Mackinac and ice sailors will be on board some of the 350+ boats that will race from Chicago to Mackinac Island on Lake Michigan. The racing begins on July 21. Here’s the annual list and please email to me and let me know if I’ve missed anyone. (Section 2), with DNer Chris Berger DN US5166 and Marcy Grunert. BANDIT’S owners Arvid Eiesland and Joe Kestler have DNs, Arrows, and an old Palmer Skeeter. John Poast is also an ice sailor on this boat. WINDSONG (Section 8) has DNer Andy Camarda on board. ..to this in a few simple steps. UPDATE: July 17,2018: The boat has found a home on Lake Como. Thanks to all who helped with this rescue. 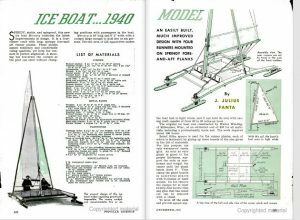 Skeeter Iceboat Club sailor Steve Schalk recently came across the proverbial barn find near Delavan, Wisconsin that dates back to the beginning of the Skeeter class.This 1930s iceboat was home built and patterned after Walter Beauvaix’s early open-back Skeeter design. Just the hull and plank remain and It’s always been stored in a dry barn waiting for either the woodpile or for someone to restore her. If you’d like to save the boat from the burn pile and take on a restoration project, contact i546@charter.net to arrange pick-up. Andy Gratton has offered to donate a sail for the boat. 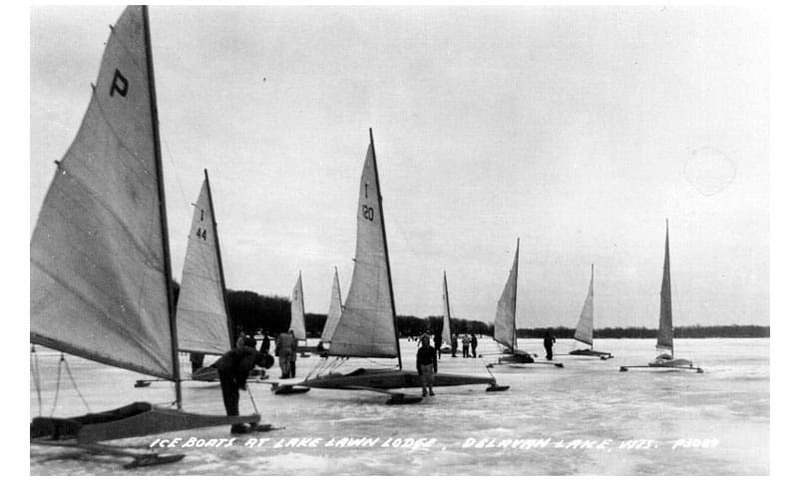 To learn more about the history of Beau Skeeters, read “A New First“, about the Goes family’s original Beau Skeeter PIKE, and “Wish You Were Here: Skeeter Iceboat Club History“. Early Beau Skeeter PIKE, on the left with the P sail.